Destiny’s Child fans, rejoice! The trio reunited for one night at the 2015 Stellar Gospel Music Awards. 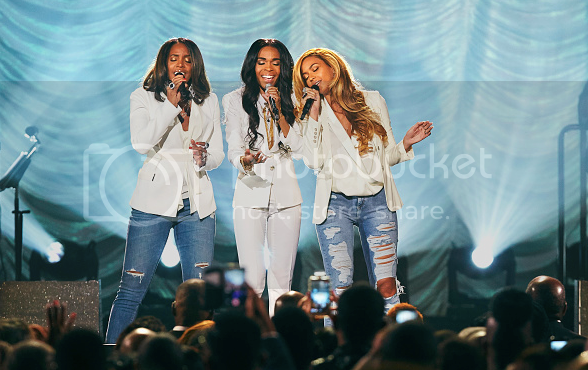 Michelle Williams, Kelly Rowland and Beyonce teamed up Saturday night for the surprise performance at the Orleans Arena in Las Vegas. Rumors swirled on Friday at the possibility of a DC reunion and the buzz was right! The three dawned the stage in white blazers singing to the heavens above. Michelle won her very first Stellar Award for Video Music of the Year for “Say Yes” on her fourth gospel album, “Journey to Freedom.” Bey and Kelly lended their vocals to the 2014 inspirational anthem and even supported the project by appearing the the video. “Say Yes” was also nominated for Urban/Inspiration Single of the Year, Song of the Year with an additional nod for Michelle in the Female Vocalist of the Year category. We last saw the “Independent Women” perform live in 2013 at Super Bowl XLVII, making this one long overdue reunion for fans. All three are working on various projects. Beyonce and hubby Jay-Z are expected to collaborate on a joint album. Kelly is busy taking on her new role as mommy to newborn son, Titan and Michelle, obviously keeping at her solo gospel career. True sisterhood can stand the test of time and distance!